Presented by Dr. Argani and prepared by Austin McCuiston. This is a 53 year old male with an abdominal wall sinus tract/chronic hematoma status post remote panniculectomy. 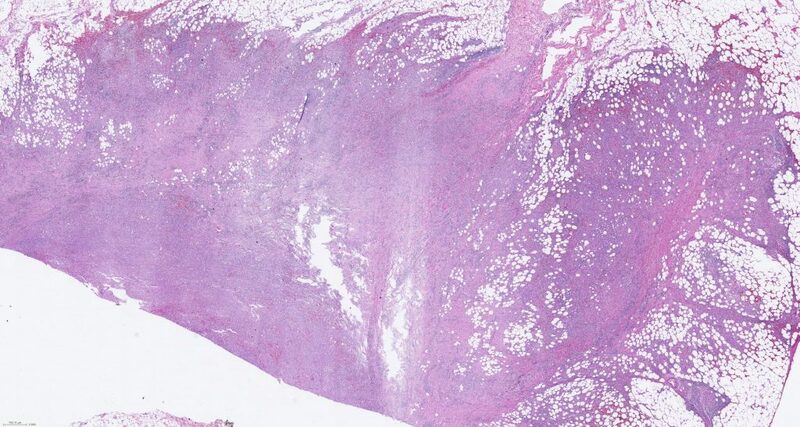 Histologic Description: There are areas of organizing hematoma here; however; there are also highly pleomorphic cells with prominent nucleoli that form vascular spaces. Mitotic figures are frequent and pericytes are not noted. The neoplastic cells diffusely label for CD34, supporting the diagnosis. 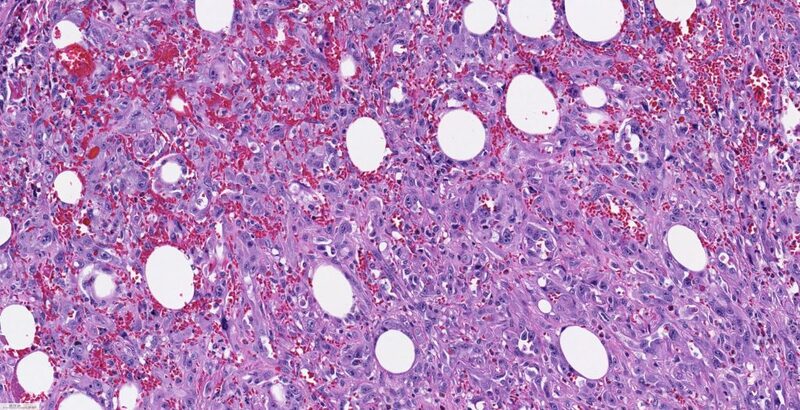 Differential Diagnosis: Papillary endothelial hyperplasia may demonstrate an anastomosing vascular pattern; however, this should be associated with fibrin and lack cytologic atypia. Granulation tissue would have bland capillaries and lack the atypia of the current case. 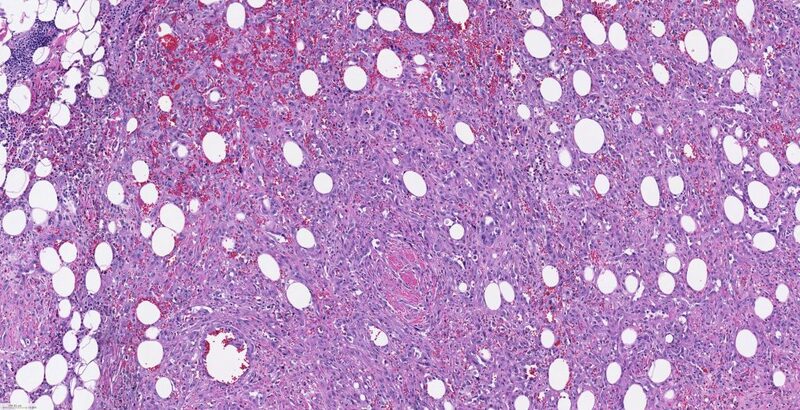 Kaposi’s sarcoma would have blander nuclei that typically are spindled, and would be associated with prominent inflammatory component. 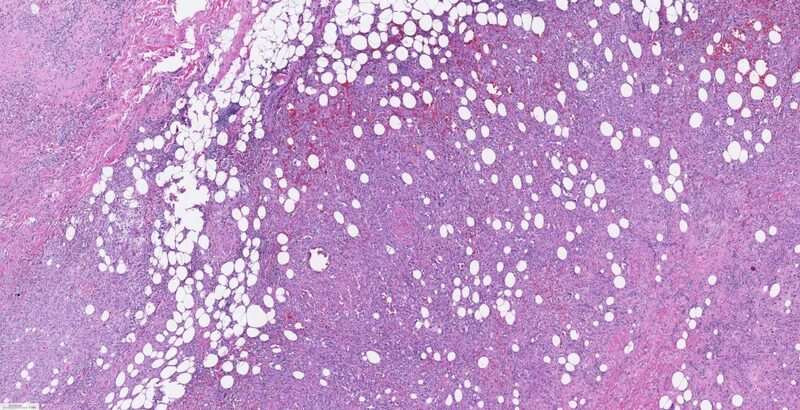 Angiosarcoma may be associated with foreign material, such as AV-fistulas. In the current case, this along with chronic lymphedema associated with the fistula tract may have predisposed to this malignancy.